Find answers to frequently asked questions (FAQs) about transportation. Just click on a question below to reveal the answer associated with it. Does the Americans with Disabilities Act cover transportation? Yes. Public transportation is covered under Title II Part B of the ADA, and private transportation is covered under Title III. Does the ADA require transportation for people with disabilities? The ADA does not require that public transportation be provided in every community. However, all public bus and rapid rail service must comply with ADA requirements for accessibility for people with disabilities. The ADA covers bus and rail vehicles, transportation facilities (rail stations, bus stops, etc. ), and bus and rail service. What about people who cannot ride fixed-route buses and trains? Providers of public fixed-route bus and rapid rail service must also provide ADA paratransit service (origin-to-destination transportation for people with disabilities who cannot use the bus or rail system all or some of the time). What does the ADA require for public transit buses? All new fixed-route, public transit buses must be accessible. What does the ADA require with regard to stop announcements? The ADA requires transit agencies to announce stops on the bus and the train, as well as to identify bus and train routes at stops that serve more than one route. Stop and route identification announcements have great value for many riders with disabilities, including people who are blind. What about “over-the-road” buses like Greyhound and Trailways? Over-the-road buses must comply with ADA requirements. 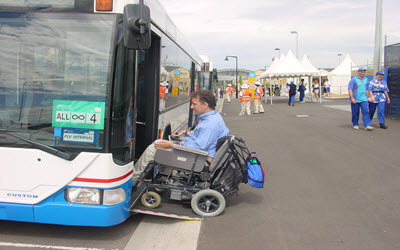 The ADA covers over-the-road buses, transportation facilities (bus stations, etc.) and bus service. This includes all fixed-route, charter, tour and other motor coach companies. Where can I get more information about transportation and the ADA?